@Nosgoroth Sorry for the late reply, I actually forgot to check this thread too. I switched over to using Tuuli, and messaged the team about it, but didn't update the existing translations, which led to the typesetter using Tory by accident. Whoops! I'll send out the message again. @quof Is there a better place for this, then? I looked in Members Only but I didn't see any threads for manga there. @nosgoroth Nah, this thread is fine. I'm just not used to checking both members only and manga yet. We've sent an email to the author with questions regarding the names. Internally a decision was made to leave Tuuli as Tory until the discussion with her concludes, to avoid changing names midway through if possible. Sorry for the inconvenience! At the very least, this way, the name change will be author certified (tm). What's with this inconstant leading? The leading on the main bubbles that use Collect 'Em All BB look okay, though the shaping on those bubbles aren't the greatest, but the bubbles that use Spinner Rack BB have unnecessary huge leading, especially when it's bolded. Hopefully you can pick up the light novel as well. Blastron just announced he's stopping the translation of the web novel so now there is no one translating it and it would be great to see an official translation appear for it. Did she say why she was stopping it? When I was setting my New Year’s resolutions for 2019, “stick to your release schedule” was pretty high up on the list. After thinking it over, though, I realized that the main reason that I haven’t been able to reliably get a chapter out is because, quite frankly, I’m tired of translating this story. When I thought about how it would take me literally over a decade to get through it at my current rate, I realized that it wasn’t a question of if I was going to drop it, but when, and since I’m not enjoying myself anymore, it might as well be now. So, unfortunately, I’m going to stop translating Ascendance of a Bookworm. This was a tough decision to make, and I’m sorry to disappoint everyone who has been patiently waiting for the next chapter. I’ll be doing one last big editing pass to (finally) fix up character names and lingering typos, then go dark for a couple months or so while I figure out what I’ll be getting into next. Thanks to all of you for sticking with me, and I hope you’ll come back when I decide on what my next project will be. Now that other series are starting to get updates any news on the bookworm front? @hansolo1300 They received feedback from the author about how to romanize characters' names, so they went back to fix old chapters first. Not sure when exactly that means a new chapter will be released. 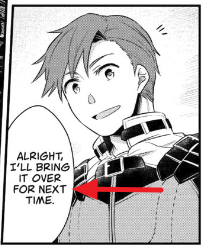 Ch.2 p23 last panel is still using "Maine" instead of "Myne". Oh, so it became Myne. I can deal. And Tuuli. Lutz is Lutz, good. 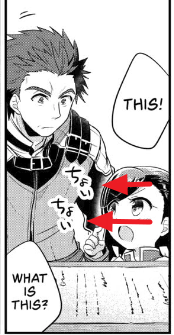 But is Urano now officially Fumino somehow (page 10) or is that an error? Yeah, the author specifically requested "Myne", which honestly is fine with me. The author in general seems very informed on European names which is very relieving and impressive. As for Fumino, uh... You didn't see anything. I swear this is the last time I'll mess up her name! I actually know someone named Fumino with kanji very similar to Urano, so... uh... Yeah I'll get that fixed. Page 03 ► Missing 2 sfx. Page 09 ► It should be BRING IT OVER FOR YOU NEXT TIME. @terabyte It could also be "I'll bring it over next time," or it could stay as-is because "for next time" is a colloquial phrase for "next time." I'm happy to report that I have no errors (that I've noticed) to report! @terabyte Thanks! The SFX are missing but yeah "for next" time was intended colloquial language. Well that's one hell of an annoying little sister let me tell you. Bwaaaaaa.